Mate Precision Tooling, Anoka, MN, has added to its press-brake tooling product line with the addition of the Mate CleanBend tool, available in European precision-style and Wila Trumpf-style tooling, and which can be adapted to American precision-style tooling. 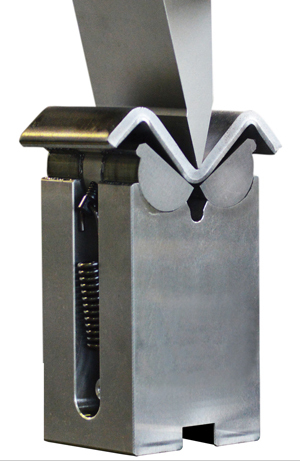 The tool’s two opposing spring-loaded half-moon rollers rotate as force is applied in the center of the die, resulting in a clean bend with minimal to no marking of the sheetmetal. Primary applications include bending of short flanges, across preexisting holes or notches, highly polished materials, and painted or coated surfaces. Mate press-brake tooling is precision-ground and induction-hardened for durability, and includes an expansive array of punches, dies, modified standards, specials and accessories. It comes in segmented, full-length and half-length sizes.